NM1 newcomer Etoile Angers Basket inked 20-year old Congolese international power forward Shekinah Munanga (203-97). He played most recently at AS Monaco Basket U21 in the ProA U21. In 34 games he recorded very impressive stats: 16.1ppg, 8.2rpg (#5 in the league), 1.8apg, 1.2spg and 1.1bpg last season. 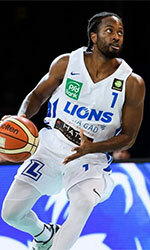 A very good year in his career as he was voted to Eurobasket.com All-French ProA U21 Honorable Mention and League Player of the Week (3 times). Munanga's team made it to the U21 Championships (Trophee du Futur) Semifinals in 2017. He also represented DR Congo at the African Championships U16 in Antananarivo (Madagascar) five years ago. Munanga has played previously professionally also in Hungary (MKB Euroleasing Vasas).